Listen to Cathryn Griffith discuss her new book on Harry Allen's "Nonfiction" show, WBAI-NY. Her interview starts at the half hour mark. This beautifully illustrated book documents the history, preservation, and present uses of Havana’s most important buildings and urban spaces. Interpreting the present in light of the past, eleven renowned architects, historians, scholars, preservationists, and urban planners in Cuba and the United States provide a rigorous examination of Havana old and new that provokes exploration of the ways we look at all cities. These authoritative policy makers and thinkers raise issues of how the most important city in Spanish colonial America developed and changed over several centuries and the extent to which it is being restored and preserved today. More than 350 illustrations juxtapose historical colored postcard images of Havana with recent digital color photographs of the same views. 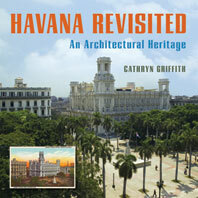 The imagery, based on years of exhaustive research and investigation, draws from Cathryn Griffith’s collection of more than 600 postcards of Havana from 1900 to 1930, over 3,000 photographs made there during multiple trips since April 2003, and extensive interviews with experts in Havana and the United States.